Carlos Carvalhal made a winning debut in English football as his Sheffield Wednesday side beat Bristol City on their return to the Championship. Tom Lees opened the scoring for the new-look Owls, heading an Alex Lopez corner past Frank Fielding. In a remarkable piece of end-to-end action, Lewis McGugan made it two with a volley, having cleared a Wes Burns header off the line moments earlier. Defeat for the Robins ended their 15-match unbeaten Football League run. Steve Cotterill's Bristol City were promoted last season as League One title winners with a club-record points total. And they started solidly against a much-changed Owls side led for the first time in competitive action by 49-year-old Portuguese head coach Carvalhal, who replaced Stuart Gray in June. Four of Carvalhal's 11 summer signings - Lopez, Marco Matias, Ross Wallace and Jack Hunt - started on their debut for the hosts and combined to create the clearest of the few first-half chances. Matias twice threatened, first hitting a tame half-volley from a Wallace cross before shooting off target after making space for himself down the left. A poor Aden Flint clearance then allowed Wednesday to pile more pressure on, with Wallace and Atdhe Nuhiu combining well, only for Fielding to get enough of a touch on the ball to send Lopez's 12-yard attempt over the bar. While Fielding got a hand to Lees' header on the hour mark, the goalkeeper was beaten by the sheer power of the defender's header as Wednesday took the lead. And just as the visitors looked to have restored parity through Burns' header, McGugan intervened on the line and immediately made his way upfield to meet a cross from Wallace and finish from close range. 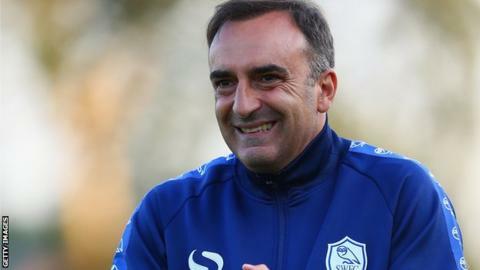 Sheffield Wednesday head coach Carlos Carvalhal: "I am happy because people around me are happy. We had a very good and professional exhibition today. "Bristol is a good team. They will be very good during the season, they play good football. We analysed them. Football is a clever game and if you understand what you have to do, it helps, and we did that today. "What I am trying to do is create a new era for the club, to break the last 15 years which was not good for the club. It was not just the last season - the last 15 seasons were not good for the club." Bristol City manager Steve Cotterill: "They played counter-attacking football at home. That's what I felt happened today. "I felt like our football was just as good as theirs, if not better. But the most important thing is they won the game 2-0. I don't want to harp on about the counter-attacking. "Sheffield Wednesday are a good club and good luck to them going forward. But, when you look at it today, from our point of view, the first goal was against the run of play and you can dominate the game but if you don't win the game it doesn't mean anything." Match ends, Sheffield Wednesday 2, Bristol City 0. Second Half ends, Sheffield Wednesday 2, Bristol City 0. Delay in match Marco Matias (Sheffield Wednesday) because of an injury. Attempt missed. Marco Matias (Sheffield Wednesday) left footed shot from the centre of the box is close, but misses to the left. Assisted by Kieran Lee. Substitution, Sheffield Wednesday. Liam Palmer replaces Jack Hunt because of an injury. Substitution, Sheffield Wednesday. Kieran Lee replaces Ross Wallace because of an injury. Delay in match Ross Wallace (Sheffield Wednesday) because of an injury. Substitution, Bristol City. Kieran Agard replaces Ryan Fredericks. Corner, Bristol City. Conceded by Jeremy Helan. Attempt missed. Marco Matias (Sheffield Wednesday) right footed shot from outside the box is high and wide to the right. Assisted by Jeremy Helan. Ryan Fredericks (Bristol City) wins a free kick on the left wing. Offside, Bristol City. Derrick Williams tries a through ball, but Aaron Wilbraham is caught offside. Goal! Sheffield Wednesday 2, Bristol City 0. Lewis McGugan (Sheffield Wednesday) right footed shot from the right side of the six yard box to the centre of the goal. Assisted by Ross Wallace with a cross.